With wild swings in gas prices pushing ever higher, U.S. drivers are slowly curbing their habits. Regular-grade gas averaged more than $3.60 a gallon nationwide in 2011 and 2012. It’s never been so high, even when adjusted for inflation. The last records were set during the Iran hostage crisis three decades ago. High prices, along with recessions, have tugged at America’s driving addiction, bringing down mileage in 1979 and again in recent years. 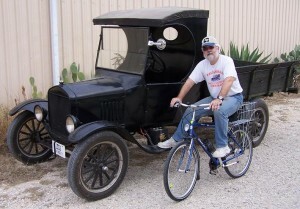 But unlike gas prices, which can arc 40 percent in a year, driving habits die hard. The difference jumps out when you juxtapose the data in a graphic. Mashing data like this can sometimes be confusing when you have two separate axes, but I think there’s an interesting pattern here. Just two days before Christmas, average U.S. gas prices have topped $3 a gallon. And you can expect prices to keep rising into spring and summer. This isn’t a typical run-up. Prices usually peak in the summer and slide down after Labor Day. In recent autumns, regular unleaded dropped an average of 22 cents a gallon, even when you exclude the freakish plummet in 2008 after the economy popped. But this autumn, gas prices shot up 30 cents a gallon. You’re going to pay a little more for a lot of things this Thanksgiving. If you drive anywhere, gas will cost about 20 cents a gallon more than a year ago. Texas prices average $2.68 today. If you fly, tickets will cost about 4 percent more. On top of that, at some 70 airports, including San Antonio’s, you now face security scanners that see through your clothes or agents who will touch in ways that few people would dare. Staying home? Cooking a traditional turkey meal will cost 13 percent more in Texas. Meanwhile, 9.6 percent of U.S. workers are looking for jobs. Experts, revising predictions, now say unemployment will remain higher than thought for years to come. Yet, Americans seem ready to celebrate, an AAA survey indicates. About 42.2 million people will make a trip of at least 50 miles this holiday weekend, up 11 percent from a year ago. On average, they’ll travel 816 miles and spend $495, nearly the same as last year. Nine out of 10 will go by car. “When purse strings and heart strings compete in a tug-of-war, especially at this time of year, the heart wins out,” AAA President Robert Darbelnet said. And so it has. Some things you can’t put a price on. Think back to the oil shocks of 1973 and 1979. The economic crashes back then are just a taste of what’s coming in two to five years, energy analyst Robert Hirsch told a conference Friday in San Antonio, according to the Express-News. 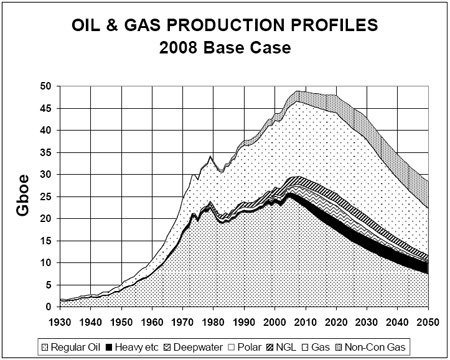 That’s when Hirsch estimates the world will reach peak oil production. After that, supplies will decline. It’s going to be chaos, the story described. And this time the recession will be much longer and tougher to turn around. “There will be no quick fixes,” Hirsch said. Hirsch first rang the warning in a 2005 report he did for the U.S. Department of Energy. He and two other authors have followed up with the “The Impending World Energy Mess,” a book released this month. Read more in this post. There it is. A rather nondescript phrase that, when plugged into Google, calls up a mountain of angst and controversy. Peak oil is the apex of production, when new field discoveries and technologies just can’t recover as much oil as we once did. The U.S. passed peak production in the 1970s. Some say we’re passing the global peak now, or about to. Millions of years worth of energy have been stored in a compact and portable form to give us oil. Unleashed a century ago, the black gooeyness had a lot to do with transforming and buoying our modern economy and way of life. Are there enough energy alternatives to replace black gold? Can we mitigate in time to avoid economic disaster? I admit, I don’t know exactly how much I pay for gas every year. I bet most people don’t. But we should, because it’s a lot. Average Texas drivers paid $1,819 for gas last year, chewing up 4.9 percent of their incomes, according to numbers crunched by the National Resources Defense Council. 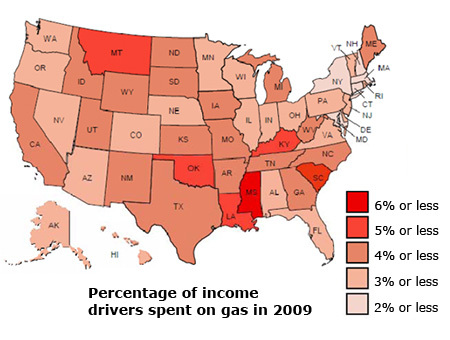 Texas ranked seventh among states for percent of incomes spent on gas. Mississippi was first with 6.2 percent, while Connecticut was last with just 2.5 percent. 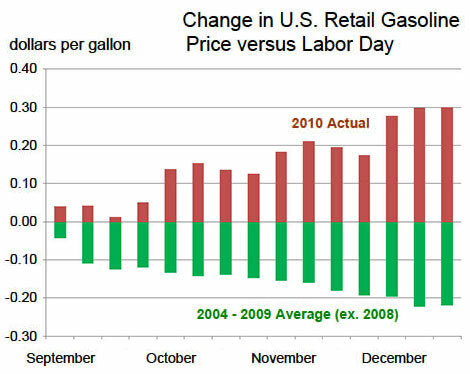 Remember, though, regular-grade gas last year was 90 cents a gallon cheaper than in 2008, when prices careened to $4 a gallon. Thus, the point of this NRDC white paper: What would happen if prices, which are steadily rising, spiked again? For Texans, the answer is gas bills 80 percent higher — or 8.7 percent of incomes. If the next spike turns into a steep plateau, the bill over a year would average $3,264. Here’s a new year’s resolution you might adopt: Check the air pressure on your vehicle’s tires at the beginning of each month. I was reminded of this when I checked mine at the beginning of this week. I began to notice my vehicle, a 2005 Dodge Caravan, was not handling as well as it should. Some of you may think it is oxymoronic to use handling characteristics in reference to a minivan but the thing just didn’t feel right. Sure enough, each tire was 4 psi – pounds per square inch – low. The ‘bus has new tires, maybe two months old, and I checked them in mid November, prior to a trip to Houston. I was surprised how much the tires went down following the recent cold snap. So, maybe you should make checking your tires a monthly chore. Just being one or two psi down can really affect miles per gallon plus, it just feels better. Like the old Saturday Night sketch about Generalissimo Franco, passenger rail between San Antonio and Austin is still dead. Oh a mortician applied a new coat of make-up, but the poor old stiff ain’t going nowhere. After twelve years of failure, a new name and an application for $5 million of tax payer money was enough to create a blip of interest but even that has not lasted long. Oh well.